AEM realized a gain of 17 horsepower and 14 lbs of torque at the wheels with this intake OVER the factory airbox! This intake was made after extensive testing and design, and is made from a silicone rubber elbow, and a 3 inch aluminum intake tube. 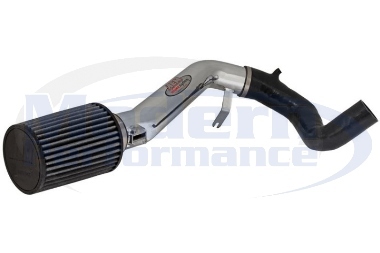 The photo above is the intake designed for the 08-10 Cobalt SS. This intake is California Air Research Board approved (CARB). Does this fit the HHR SS also? No this will not work with the HHR. I beleive K&N/AEM have a different part number for the HHR intake. There is no cutting neccesary for any sheetmetal with ANY intake that we sell for the turbo Cobalt. You do not need to remove the bumper, but if you loosen the bumper cover on the passenger side it will allow better access. Installation takes about 1.5 hours and black and white photo installation instructions are provided in the box.